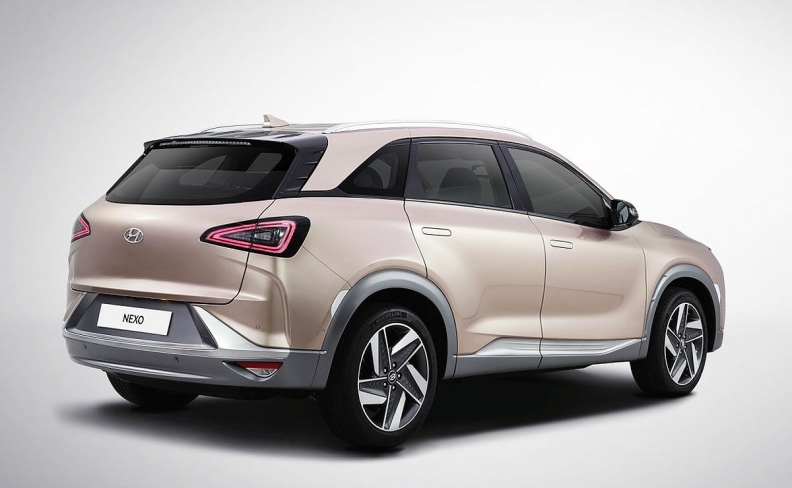 SEOUL -- The Hyundai Nexo fuel cell vehicle marries futuristic fuel cell technology to next-generation autonomous-driving systems in a rolling showcase that aims to quash any notion the South Korean automaker is a straggler. 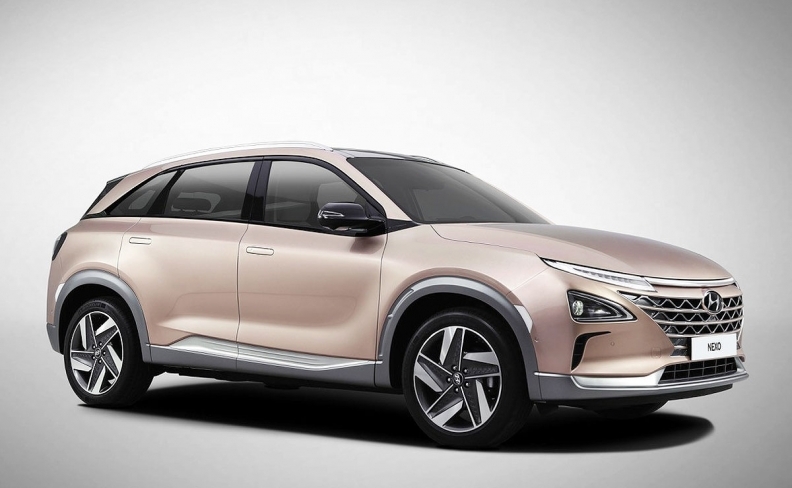 The zero-emission hydrogen-powered drivetrain, unveiled here Tuesday, delivers what Hyundai says is the world’s best fuel cell driving range. The autonomous-driving features include a new blind-spot detection system -- which Hyundai says is the first of its kind -- as well as the automaker’s first application of an auto-steering lane-keep assist. Wrap all that into a sleek crossover package that taps the red-hot utility segment, and Hyundai is hoping the public sees this tech-savvy green car as a real choice -- not just a science project. The Nexo goes on sale in South Korea later this month before reaching Europe in the late second quarter and the U.S. in the fourth quarter this year. As a fuel cell vehicle, the Nexo will undoubtedly be a low-volume player. But the new crossover marks a key step in Hyundai Motor’s plan to introduce 38 eco-cars by 2025 and commercialize Level 4 autonomy by 2021. Indeed, using the ongoing Winter Olympics as a global stage, Hyundai upgraded a fleet of modified Nexos with Level 4 self-driving systems. Earlier this month, those Nexos drove themselves from Seoul to Pyeongchang, host city of the winter games, some 118 miles away. Hyundai called it the first time such sophisticated autonomy had been demoed with a fuel cell. Hyundai says the Nexo bests its predecessor, the Hyundai Tucson Fuel Cell EV crossover, in every category. The Tucson fuel cell crossover debuted in 2013; Hyundai has managed to sell only about 800 of them cumulatively in South Korea, the U.S. and Europe. For starters, the Nexo’s electric motor output climbs to 120 kilowatts, from 100. Its driving range is extended 30 percent, and its three hydrogen tanks can hold more fuel while weighing less. The Nexo’s overall fuel cell stack is also more efficient. Its power density improves by half, its overall size drops 18 percent to save space under the hood, and it is 14 percent lighter. The Nexo is also zippier to drive, accelerating faster than the Tucson with more torque. Hyundai was able to achieve the improvements with Nexo partly because it rides on a dedicated fuel cell platform optimized to the task. It predecessor was a retrofitted Tucson. The Nexo also outdoes rivals from other automakers in terms of range. Hyundai says the Nexo delivers a full-tank driving distance of 378 miles under South Korea’s testing regime and more than 350 miles under the EPA’s. Under EPA standards, the Toyota Mirai fuel cell sedan has a 312-mile range, while the Honda Clarity fuel cell sedan is rated at 366 miles. While the Clarity may offer the Nexo competition under EPA ratings, Hyundai said its own in-house testing of the cars shows the Nexo on top. “We are quite certain the range will be the best among any fuel cell car,” a spokeswoman said. Meanwhile, Hyundai is loading the Nexo with new self-driving and advanced safety systems. It gets an around-view camera blind-spot monitor that sees angles on both sides of the car that can’t be reached by traditional mirrors. It beams images the blind spots to a display in the center console of the car while changing lanes -- a system Hyundai claims is world-first technology. The lane following assist function -- a first for Hyundai -- enables the car to steer itself down the road and keep centered in the lane. It works at speeds from 0 to 90 mph. Finally, Hyundai is deploying a remote parking assist function in the Nexo. That allows the crossover to park itself with the touch of a button, even when there is no one inside. Hyundai bills it as a handy feature for parking in crowded cities or narrow garages. Hyundai offers those systems on top of its Hyundai SmartSense suite of advanced safety systems, which includes such functions as forward collision warning, land-keep assist, collision avoidance, a driver monitoring system and rear cross-traffic alert. Hyundai did not disclose pricing for the Nexo. At the Olympics, Hyundai will be showing off its fuel cell prowess in a fleet of four buses that ferry spectators around. Each is equipped with a new driver-monitoring system that can tell when the driver is getting sleepy or not paying attention. It is the first application of such technology in public transport in South Korea, Hyundai says. The Level 4 technologies demonstrated in the cross-country drive to the Olympics aren’t part of the production Nexo, Hyundai says. They were deployed in three Nexo crossovers, as well as two Genesis G80 sedans, to exhibit Hyundai’s most cutting-edge gadgetry. The Level 4 Nexo, for example, bristles with an array of radar, lidar and cameras. It also boasts a 5G cellular connection courtesy of South Korean mobile phone provider KT Corp. The 5G system is up to 100 times faster than today’s 4G systems and provides lightning quick connections for a variety of Internet-based systems. One dubbed Home Connect, allows drivers to view home camera images in real time and do things like turn off the TV or turn on the air conditioning, while on the go. Another called Assistant Chat acts as a digital assistant answeing questions. There’s even a karaoke application called Everysing for those who need to get their diva on. Hyundai says it wants to commercialize Level 4 autonomous driving in “smart cities” by 2021. In January, it teamed with U.S.-based Aurora Innovation to develop such systems. The automaker envisions having full-autonomous systems ready by 2025.